Home Local News BREAKING! Ex President Benigno Aquino III binigyan ng warning si Pres.Digong Duterte ! BREAKING! Ex President Benigno Aquino III binigyan ng warning si Pres.Digong Duterte ! 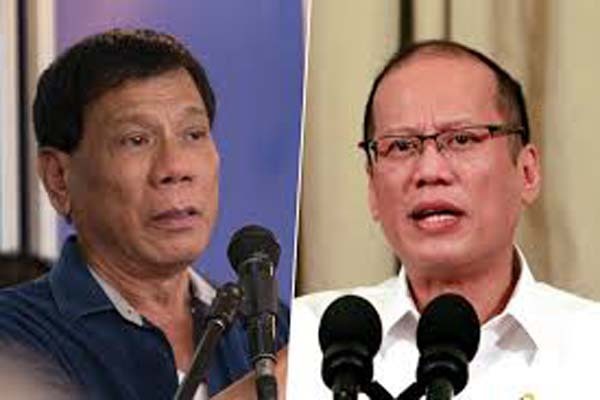 Former President Benigno Aquino III gave a warning shot to President Rodrigo Duterte before the latter assumed the position of chief executive, that he would fight should the man go for a dictatorship and throw away the freedom fought for by his martyred father. Aquino on April 29, 2017 in Iloilo said he was willing to die to stop the country from going back to the times of Martial Law under Marcos. “Hindi ko matatanggap na walang nangyari sa pagkamatay ng tatay ko at iba pa nating mga kababayan, libo-libo po. ‘ailangang ibuhos ko ‘yung magagawa ko. Kung buhay ko ang katapat iyon lang ang tangan sa akin, e dapat hindi ganun kaimportante ‘yung buhay ko dahil hindi ko mailalaban ‘yung ipinaglaban ng tatay ko. Hindi magkakaroon ng kabuluhan,” he said. The former president’s father, Ninoy, died in August 21, 1983 which triggered protests against the Marcos dictatorship and led to the EDSA People Power revolution. Aquino cited the words of Duterte in his April 29 interview with GMA News, which he said brought back the memories of the country’s dark days. Duterte in that interview declared that he would abolish Congress if Senator Antonio Trillanes would carry out his plan to impeach him. When Duterte proposed a revolutionary government, Aquino responded by saying that it would be like martial law, and at the same time, reminded him that his mother also had the same government, but the laws were approved first by the Filipinos. Sponsor “My mother mother didn’t exercise powerr all by herself. She immediately came up with the 1987 Constitution which was approved by 90 percent of Filipinos,” said Aquino. He said that while still president, several sectors raised their concerns about the country’s future should a man who had no respect for women and children sit as president. He also said he was forced to apologize to the United States and Australia for the then campaigning Duterte’s remarks against the country’s allies. He said Duterte’s brusque behavior could cause trouble between the Philippines and its international allies. “Katulad ‘yung kanyang pagsasalita ay naiiba. Okay na kaya iyon? Iyon bang ganung klaseng pagsasalita magdadala ng isang kilong bigas sa kaninumang hapag? Kapag naghanap tayo ng kakampi at binati mo ng pabalagbag, ilan kaya ang kakampi sa atin? E mabigat ‘yung kalaban natin sa South China Sea,” said Aquino.